Our Bookish Family – Book reviews and more from our family to yours! Hey guys it’s Emma here! Sorry it’s been so long since I’ve posted a review. I have been busy reviewing books for Creative Kids Magazine and our blog kinda fell apart. Anyways, here is a review I wrote for CK Magazine. I hope you enjoy! Helen needed a body to be with her beloved and Jenny needed to escape from hers before her spirit was broken. It was wicked, borrowing it, but love drives even the gentlest soul to desperate acts. When Jenny returns to her body, she finds that someone has been living her life while she was away. She doesn’t remember being Billy’s lover or defying her family. But now she is faced with the consequences. And Helen, who has returned to warn Jenny—to help her—finds herself trapped, haunting the girl she wished to save. In this captivating companion novel to A Certain Slant of Light, the love story between Jenny and Billy begins out-of-body—where they can fly and move the stars–and continues into the tumultuous realm of the living, where they are torn away from each other even as they slowly remember their spirits falling in love. Under the Light is the sequel to A Certain Slant of Light, and a book I was truly pleased to receive. It is a story of two girls; Helen, a ghost who took over a young girls body and Jenny, the young girl that cannot remember what happened during the time her spirit was separated from her flesh. Under the Light is broken down into three parts. The first from Jenny’s point of view, the second from Helen’s and the third switches seamlessly between the two. Helen’s choice to take over Jenny’s body has had some unimaginable consequences for Jenny. In Under the Light we catch up with Jenny after her body has been returned. We follow along as she struggles to recall the weeks worth of memories she has lost while she tries to separate dreams from reality. As the pieces start to fall back into place for her she tries to mend broken relationships and reconstruct the past week. Although the main focus of this book is on Jenny it just would not have been complete without Helen. When we are first introduced to Helen we find her in Heaven. But she felt a lot of guilt for what she had done to Jenny and wanted to help guide her along to reach her own happy ending just like she had with James in the previous novel, A Certain Slant of Light. While I suggest you read A Certain Slant of Light before picking up Under the Light it certainly isn’t necessary. This novel was beautifully written as I expected from Ms. Whitcomb. It left me with a sense of hope. I’d recommend this book to anyone feeling lost in his or her own life. You may shed a few tears while reading this book but the ending will leave a smile on your face. Hey it’s Jamison! I just wanted to take a minute to introduce myself before I gave a review for the Magic Tree House book I just finished reading. I’m 8 years old, in second grade and my favorite types of books are comics and adventure. I really like Magic Tree House, Big Nate, and Calvin and Hobbs. I will be posting book reviews, book hauls, and if I can convince my mom maybe some game posts as well. 🙂 I also love to write stories so maybe I will share a few of those on here as well. Now on to the book review! Have you ever met a real live ninja? Jack and Annie do when the Magic Tree House whisks them back to ancient Japan, where they find themselves in the cave of a ninja master. Will they learn the secrets of the ninja? Or will the evil samurai warriors get them first? In Night of the Ninjas 8 year old Jack and his 7 year old sister, Annie, have been looking for the Magic Tree House for days. Finally one night on their way home from the library they find the tree house is back in the Frog Creek woods. Inside the tree house they find a glowing M on the floor, a note from Morgan le Fey(the magical librarian from the time of King Arthur!) that reads “Help me find 4 things..”, and a mouse that Annie promptly named Peanut. For the rest of the story Jack and Annie are on an adventure to get back to the tree house and back home safely to Frog Creek, Pennsylvania. Along the way they run into a samurai and lose Peanut! 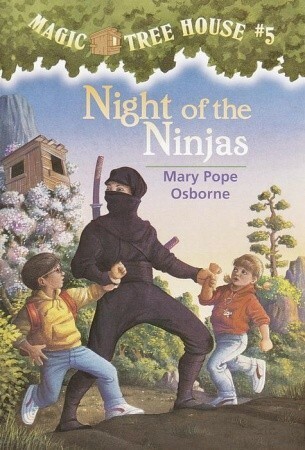 I really liked the book because of the ninjas and the exciting adventure Jack and Annie went on. I will recommend this book to all my friends at school. I will also be reading more books from this series. Hey guys Emma here! I told you I was tots excited about reading the Riley Bloom series by Alyson Noel. 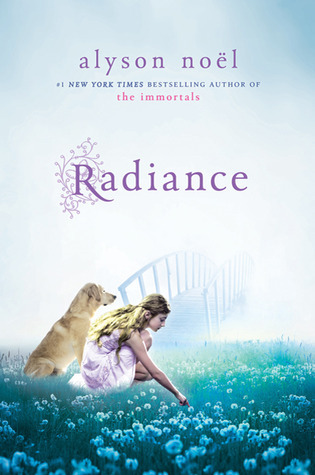 Today I began reading Radiance, book 1 in the series, and finished it within 2 hours. So, I promised you a review and here it is! I absolutely loved this book! The main character, Riley Bloom, is a 12 year old girl with attitude who died a year ago. Riley finds herself in the Here and Now after she crosses the bridge. There she finds out that she lives with her parents and loyal dog Buttercup on the same street, in the same house that she was living on when she was alive! Once she gets settled in the Here and Now she finds out that everyone has a calling or job. Riley’s job is soul catching. This is when we are first introduced to Bohdi; a lovably, adorkable boy who will be Riley’s guide/teacher/boss/coach as she learns the art of soul catching. For her first assignment Riley is assigned the task of helping the Radiant boy cross over to the Here and Now. The Radiant boy has been haunting Warmington Castle in England for centuries. Many soul catchers have tried to cross the Radiant boy over and failed. This is when I found the story really started to getting interesting! The story was filled with many unexpected turns that I couldn’t put it down! I connected with the characters of this story and could picture them in my mind while reading. I absolutely loved the ending of the book and found it to be very unique. I am looking forward to reading the second book in the Riley Bloom series Shimmer. I hope you enjoyed this review. Thanks for stopping by! Hey guys Emma here again! Today I wanted to share with you all the books I have received over the past week. My parents picked me up a few books from the recent Half Price Book Sale and I also got a few books from my school’s Scholastic Book Fair. So first let’s talk about the ones I got from Half Price Books! All of the books my parents picked up were $2.00 or less. The hardbacks were $2.00 and the paperbacks ranged in price from $.50 to $1.00, can’t beat that! The next series my parents picked up at the Half Price Book Sale is The Clique Series by Lisi Harrison. The next 5 books are also by Lisi Harrison and make up The Clique Summer Collection. I also got 5 books from the Princess Diaries Series by Meg Cabot. And finally, these three books are part of the Riley Bloom series by author Alyson Noel. I am only missing book four,Whisper, in this series. I am super excited to begin reading this series. It is a children’s fantasy series that follows Riley Bloom as she figures out her way around the afterlife, Here. I will post a review on these books as soon as I can because they are are the ones I am most excited about reading fro my Half Price Book haul. Now moving on to the books I picked up at the Scholastic Book Fair at my school. Of these three books I am most looking forward to reading the Princess Academy Palace of Stone. I am going to have to get my hands on book one, Princess Academy, first though because I can’t bring myself to read a series out of order! So there are all the books I have received over the past week! Quite a few and I will have lots of books to read now over the summer! I also made a youtube post of my book haul. If you want to check it follow the link below! And my camera wasn’t working right but I will update this post with photos soon! Hi I’m Emma and I am 9 years old and love to read. I am tots exited about the blog and if you do not know what tots means it means totally and I can’t wait for the next post by one of my other family members. I hope you enjoy this post about Werewolf versus Dragon, the first book in the series An Awfully Beastly Business by David Sinden, Matthew Morgan, and Guy Macdonald! The Royal Society for the Prevention of Cruelty to Beasts (RSPCB) operates a rescue center for werewolves, dragons, fairies, giants, sea monsters, and other fantastical creatures. The RSPCB has stopped crimes against beasts, but there are still some people out there who will do anything to get their hands on one of these mythic animals . . . even if that means crossing the members of the RSPCB. In the first book, Werewolf versus Dragon, a dragon’s mangled body arrives at the RSPCB, and the Society knows that they’ve got a real monster on their hands. Ulf, a werewolf-boy, and his friends must stop the most evil beast hunter before it’s too late. The adventure continues in the second book, Sea Monsters and Other Delicacies, for Ulf and his friends, Orson the giant, Tiana the Fairy, and Dr. Fielding. A sea monster has suffered a life-threatening injury, and it looks like the evil Baron Marackai is back;and this time beasts are on the menu. Ulf must stop him again;the future of the RSPCB depends on it. I loved reading Werewolf versus Dragon, book 1 in the series An Awfully Beastly Business, by David Sinden, Matthew Morgan and Guy Macdonald. In Werewolf versus Dragon we are taken on an adventure with Ulf, Dr. Fielding, his friend Tiana the fairy and Orson the giant. When two fire belly dragons, mother and baby, are heading from the Great Volcanoes past the Royal Society for the Prevention of Cruelty to Beasts (RSPCB) on their migration route to the Ice Mountains of Greenland they run into trouble. An evil beast hunter and his two helpers shoot down the baby dragon and kidnap the mother. Ulf, Tiana, Orson and Dr. Fielding must work together to find the mother and stop the beast hunters. I enjoyed Ulf, a werewolf boy, who was rescued by Dr. Fielding and brought to the RSPCB.The RSPCB is a rescue shelter for mythical creatures. Dr. Fielding runs the RSPCB and provides the many creatures with shelter and medical care until they can be released back into the wild. In this book the mother fire belly dragon once lived at the RSPCB. She was hatched their by Professor Farraway 50 years ago. Professor Farraway started the RSPCB, he was the world’s first cryptozoologist and an expert on endangered beasts. He passed away long ago leaving all his money to the RSPCB and leaving the RSPCB in Dr. Fielding’s care. I hope you enjoyed this post. If you happen to get this book at the library I hope you like it as much as I did.Thanks! Hi there I’m Erin! Let me be the first to welcome you to my family’s little corner here on wordpress. Here our kids Emma (9), Jamison (8) and Jaxon (7) will be posting book reviews, book hauls and more. Since my husband and I will be monitoring and maintaining their blog I wanted to be the first to post here so everyone that stops by is aware that this blog is run by the kids. All of our kids are avid readers and are looking forward to posting reviews for other children (and parents!) to help them decide if its a book they’d like to read. Once school is out for the summer I am sure the posts will become more regular as they have more time to devote solely to reading. But Emma is already in the process of writing her first review as I type this, so look for that later this week! Feel free to e-mail the kids with any suggestions or comments at ourbookishfamily@gmail.com. The e-mail account is also monitored by my husband and I.